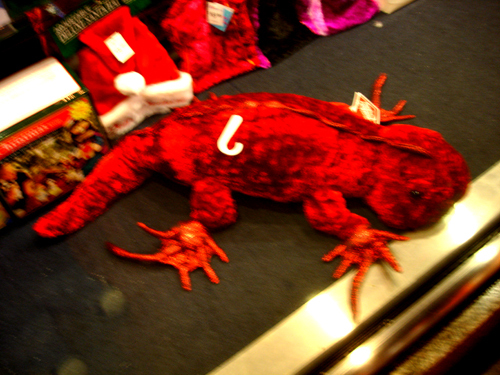 on why i will never be mistaken for audrey hepburn, chapter 23: instead of ritualistically licking the window at tiffany's, i pause each night on the way home from work to stare at a giant red crushed velvet iguana. he lives in the window at duane reade on broadway, and i assume he's part of their yearly deluge of huge, cheap stuffed holiday gift animals, not unlike the chenille chicken i bought for paul a few years ago (though that was for easter and from safeway in san francisco). per joe, i am not allowed to purchase the iguana because our apartment is already full of crap (also because he, the iguana, is ugly). in spite of this, i have named him yul and written a song (to the tune of stephen malkmus's "jo jo's jacket") about how much i love him. so much for avoiding complicated and boring. From the Chateau Marmont ladies' room, The OC's Mischa "No Blood for Oil Heirs" Barton spoke of her newfound appreciation for Jacob. "He looks like, you know, that guy in Jarhead, and he could totally write my autobiography for me," monotoned the starlet. "I've heard he has a girlfriend, but could she stick her arm up a gumball machine and score him free candy? Whatever, hold my hair back." how'd the joan didion work out? incidentally, if you *happen* to find the piece in which she likens a piece of overheard dialogue on an airplane to "one of those 'little epiphany' stories" that bother her so much because they don't ever get at the marrow of life, tell me where it is -- i never managed to locate it a second time. her essay on the hoover dam was the apex of whichever collection it was in. so it seemed to me in college, anyway. pica, pretty sure the didion snippet you're talking about wasn't in this collection (though a quarter-memory of something like it is now driving me crazy). in related news, i got spam today with a subject line that read YOUR EXPERIENCE COULD BE WORTH HUNDREDS!